The four-in-hand is named for the coach and four, either because reins were held in a manner which the necktie seemed to parrot, or because the coachmen purportedly tied their own cravats in this manner to keep them from flying off while driving. It is the perfect knot because it is small and precise, and it is appropriate with British and American natural shoulder dress in this country. The Windsor knot, which was purportedly introduced by the Duke of Windsor in the 1930s, was intended to go with the cutaway, a wide Windsor collar, and it is too bulky to fit well in the collars of most shirts today. 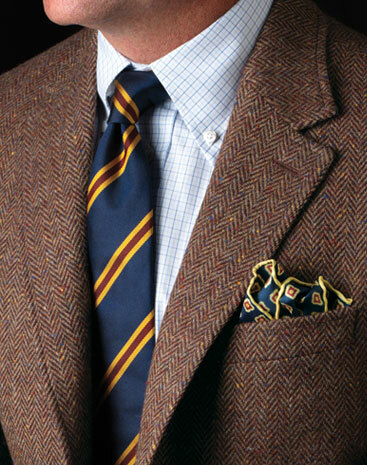 The half-Windsor is appropriate when a larger knot is desired. To tie a knot perfectly, be sure to pull up the knot smartly so as to create a dimple in the center of the tie directly below the knot. A slight twist upward will set the knot in place to display the tie to its best advantage. If a knot lies straight upon the shirt, the tie will have no life to it as light will not reflect off the silk to show the tie at its best. Bow ties can be butterfly or bat shape, but always should be tied to produce a softly shaped bow. While a butterfly bow tie is approximately 2.5 inches wide at the end, a bat bow is often narrower. Whether bat or butterfly, a proper bow tie must always be “to-be-tied” not pre-tied. A bow tie, with its flash of color nearest the face, makes a statement of individuality, and nothing contradicts that statement more readily than having it pre-tied. Click on any of the knots listed at left for a step-by-step tutorial on how to tie a tie with each knot. They are all considered essentials of the proper gentleman's wardrobe. You will find that Ben Silver authentic neckwear features the best materials and workmanship to create the perfect knot every time.